The first Internet search I think I ever did, back in the mid 90s, was “yoga.” I was a teenage basketball player and even though I wasn’t too shabby when it came to running and jumping and pushing people around, I missed the flexibility and strength I’d had when I was a dancer and tumbler. I thought yoga might help me find it again. Except, as it turned out, just searching “yoga” in 1994 didn’t provide me a list of videos and tutorials and whatnot. It spit out a list of poses (by their Sanskrit names, btw, which was pretty intimidating) and some written out descriptions. No pictures. No illustrations. No chance of me being able to follow along at all. But! Now, I attend classes occasionally and practice often on my own, and I really love it. So, to keep you from having a similar experience to my intro to yoga, I’ve put together a few things you should expect. Those of you who’ve taken (or taught!) yoga classes, please add anything I’ve missed in the comments. I’m sure I didn’t get everything! 1. If you’ve been practicing yoga on your own, you’ve probably been doing it wrong. There are a lot of subtle adjustments that need to be made in each pose in order to get the full benefit, and if you’ve never had a professional watch you and help you get into the proper poses, I will bet you money that you’ll be making some changes in your first class. 3. There’s equipment involved. You probably already know that you’ll generally use a mat — if you don’t have your own, it’s a good idea to make sure they’re available in your class. (They often are.) But, there are a few other items you may want to use, especially as a beginner (although plenty of people use them long after their newbie days — I never do a class without a block and strap handy). Yoga blocks and straps will allow you to attain proper form in certain poses when you lack the flexibility or strength to, say, place your hands flat on the ground or grab the bottoms of your feet in a seated forward bend. 5. Fitted clothing is more than just a fashion statement. You don’t have to wear skintight leggings and a fitted tank, but there are reasons many people tend to do so. For one thing, it’s easier for the instructor (and for you) to see your form and whether you need to move your knee in or flatten your back if you’re wearing something somewhat fitted. Plus, baggy pants can get in the way while doing standing poses, and baggy shirts are sometimes problematic if you go upside down at all. Wear what makes you comfortable, but consider the movements you’ll be doing when you make your wardrobe selection. 6. That 90-year-old man in the corner will twist into a pretzel before you can even say, “Om.” Yoga is funny — you absolutely cannot tell who’s, you know, bendy, just by looking at them. You can’t tell who will have great balance or strength, either, because the muscles you use and the ways in which you’ll twist are very different than what you do anywhere else. Try not to go in with any expectations, either about yourself or your classmates. 7. Not all classes chant. The stereotypical yoga class that I pictured when I first pre-Googled “yoga” was filled with hippity-dippity folks who twisted into knots and chanted things in a foreign tongue. Now, those classes totally exist, but there are plenty of classes that focus more on the physicality of yoga rather than the spiritual part. 8. Not all classes are alike. Not. Even. Close. There might be more types of yoga classes than types of wine. You can do gentle restorative yoga, challenging hatha yoga, invigorating vinyasa flow yoga and many, many more. Plus, within all those types, there are differences in levels of difficulty as well as different amounts of mind-body focus (like chanting). Some will end with corpse pose and you’ll feel dreamy and relaxed. Some will leave you sweaty and ready to take on the world. Some will have a really hands-on instructor, and other instructors will just offer general guidance to the room. If you attend one and don’t love it, don’t give up on yoga — just try another class with someone else! 9. You’re probably going to hurt afterward. Between stretching in ways you otherwise wouldn’t and holding poses that require your muscles to work hard in a variety of crazy positions, you’re likely to feel this the next day. That’s okay — it gets easier (and less painful). I promise. 10. 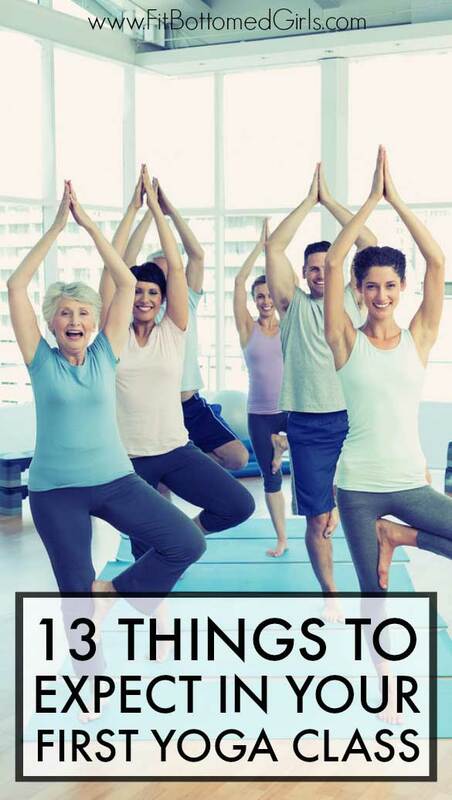 You’ll start incorporating things from yoga class into your everyday life. Now, if you attend a mind-body-focused class, you’ll probably set an intention that you can carry with you throughout your day, but even if you don’t, yoga is great for teaching you about breathing. You’ll learn to breathe in different ways (which, in turn, have different effects on both your mind and your body). You also might just find yourself utilizing certain poses as you move throughout the day, maybe because you like practicing, or maybe just because they feel good. 11. You’ll be surprised by what you end up liking. Go in with as open a mind as you can manage. You might think you don’t want to meditate at the end, but try it — like, really try it. Maybe you’ll go in looking forward to the stretching aspect but end up loving the balance poses because they make you feel strong. Or maybe you’ll realize that a flow practice is just the challenge you need. That’s great — allow yourself to embrace whatever it is about the class that makes you happy. 12. You (or someone near you) might pass a little gas. Think about it — you’re twisting and bending in ways that are designed to squeeze and massage your inner organs. You’re taking in deep breaths. It’s not uncommon to toot. I mean, it’s not ideal to do it, like, a lot in a crowded class, of course, but if you suddenly hear the proverbial mouse on a motorcycle, don’t freak out. 13. You’ll feel a little goofy at times, but you won’t be alone. Yoga puts you in some unflattering and unladylike positions, and at first, you might feel a little self conscious. Try not to be — remember, everyone there is doing the same thing, and nobody’s watching you. You might fall over in Warrior III or find your legs start shaking violently while in Extended Triangle pose, but I promise you, you won’t be the first. Or the last. Not by a long shot. I was so nervous at my first class! I was not in great shape and not flexible AT ALL, so I was pretty sure I would look and feel like an idiot. My instructor was great, though. He gave modifications that made all the poses adaptable for those of us with limited abilities, and he reminded us throughout our practice that yoga is a personal meditation and that no one is there to compare themselves to anyone else. It really helped me let go of my self-consciousness and I fell in love with yoga fast. I didn’t go to my first chanting class until about ten years later, and I thought it was kinda weird at first, but then I realized how good it could feel to belt out an “om” in the middle of such exertion. I love yoga! I do power yoga 6-7 times a week (sometimes 2 a day) and my body has changed a lot in the last month since I started. I think its also worth mentioning some studios heat their rooms which adds to the challenge of yoga, but you get used to it! I did Bikram on and off for a few years, i do Power now and love it. As a yoga teacher, I appreciate this article! I love the tips and the what to expect advice! You really touched on a lot of important things. Thanks!